Deciding where you’re going to put the safe is often more important than what gun safe you are going to purchase. Based off another article of ours called the hidden gun safe theory, you can get away with purchasing a very cheap safe and still be protected from burglars. If you didn’t read the hidden gun safe theory article, we suggest you do that. But if you don’t have the time – it basically means that if a burglar can’t find your safe; they aren’t going to steal from it. So where are some places that you should put a gun safe? Believe it or not even the best hiding spots can often not be good enough to beat the best burglars out there. You have to remember that some of these criminals are lifelong, career criminals and aren’t afraid of anything. They also know how to get around the best security systems and crack the most secure safes. This is where the idea of where you decide to put your gun safe is more important than what gun safe you buy. All of us are susceptible to home invasions, but that is not the only risk that a lot of us face. For example, our readers down in Louisiana, Florida or any other Southern state can face extreme flooding from natural disasters or flash floods. This means that not only do they have to worry about burglars running around in the neighborhood, they also have to worry about the weather acting against them. It is a great idea for somebody living in a Southern state to put safe on the second floor or up in the attic. This way the water won’t touch it for the most part and it will be difficult to find for a burglar. What about if you’re somebody who lives in tornado alley? Maybe you are in Oklahoma and tornadoes are about as common as the sun setting. You’re going to want to place your safe in the basement. Somewhere where the thief will not be able to find it easily. Everybody knows the age-old argument that when a tornado strikes, you need to go down into the basement. This is no different for your safe – as even though it may be over 1000 pounds, or in some cases upwards of 2000 pounds, is still not enough to withstand a tornado. Keep this in mind. Even though your floors may feel solid, this alone does not mean that it can support 1000 pounds. There’s never been a human in human history that has weighed more than 1000 pounds, so nobody can relate to weighing this much. 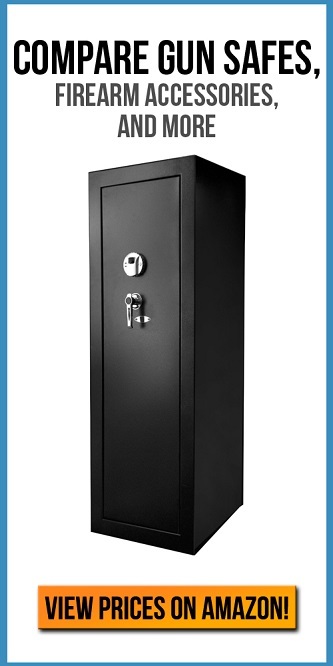 However, it is not uncommon for a gun safe that is built with high-end materials to weigh this much. Nothing would be worse than to have your gun safe blow through the floor. Cracking open and destroying itself just because it was too heavy. Plan for this accordingly. We recommend that you get a professional carpenter to come around your house and take the proper measurements. You do not need to be an expert. You don’t have to tell them you are looking to place a safe in your house. Just simply tell the carpenter that you are worried about whether or not your floors can support a certain amount of weight. They will give you the answer. This is a crucial detail to pay attention to. Not every floor surface is created equal, either. We recommend hardwood floors for the placement of safes because carpet can result in an unlevel safe. If your safe is unlevel, there’s a good chance the locks will not work properly. Not only that, but a hardwood floors create a sturdier foundation. With children running around you do not want the possibility of the safe tipping over on top of them. Anyone that wants to access their gun safe daily or weekly, you’re going to have to make sure that you purchase one that is not difficult to use and not difficult to get to. If you cannot get it open on a regular basis or it’s difficult to gain access to, then there’s a good chance that you will be leaving firearms or other accessories out in the open. This completely negates the purpose of the gun safe. This is why we do not recommend that you put your gun safe behind a piece of furniture; like a coach or any other kind of heavy furniture. Having to move furniture every day will only result in frustration and you neglecting the gun safe. Having your gun safe be visible from the outside of your house completely defeats the purpose of it. Any thief that can see what they want to steal before they enter a home is probably going to be successful in getting away with what they want. They know the exact route they have to take to get at the safe before even entering your home. This is why we recommend they put the safe in a closet or basement. Not too many people will be peeking down to the basements. Normally they are dark and nobody can see into a closet from the windows. Closets can be advantageous because if the gun safe is placed properly, when the closet door swings open, it can block the view of the gun safe. Creating an advantage for you because only you will know it’s behind there. Most thieves will not look behind the door. Keep in mind, as said earlier, gun safes are really heavy. 1000 pounds is not unlikely and there have been some that have weighed upward of 2000 pounds. Think of a spot that will be difficult for the thief to pull the gun safe out of. This is why basements work because no thief will be able to drag a safe up a flight of stairs by themselves. They will have a difficult time pulling it out closet as well. It might be annoying to move the safe into a basement, but if you’re only doing it once then it is not a huge deal. The next time you will probably do it is when you are moving. The most common spot for house fires is in the kitchen. Somebody’s cooking and pours too much oil or is not paying attention. The next thing you know the kitchen is set ablaze. If your gun safe is at the other side of the house, there’s a good chance of the fire department or even yourself putting out the fire before it reaches the safe. Gun safes are noted for their fire resistance, but don’t risk it. Properly planning ahead for potential fires is a great way to avoid them. Think about a spot in your house that is safe, secure, out of sight and away from the kitchen. If you have a wood stove inside of your house as well, then you should factor in that into your planning. Make sure you’re properly cleaning out your chimney every year to prevent any kind of fires. The reality that we live in is that some burglars are so good at what they do, that no matter how much planning you put into the location of the gun safe, you may still not be able to beat them. This is why when you’re deciding on where you want to put the gun safe, it is best to not stress out. Simply find a dark closet or dark basement and place it there. As time goes on, you can put more thought into the placement of your gun safe. You will determine whether or not the positioning you have for it is the best spot. Don’t be afraid to envision a possible home invasion. Peeking through your own windows from the outside and seeing whether or not you can locate your safe is advantageous as well. The best way to beat a thief is to think like one.